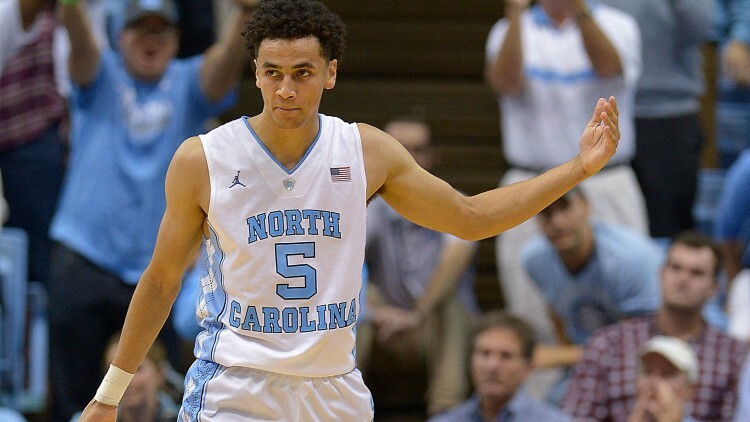 ​​PHILADELPHIA, Pennsylvania - North Carolina senior G Marcus Paige nailed his first four three-pointers early in UNC's Sweet Sixteen matchup against Indiana, and as they all swished through the nylon net, you could just feel that it was going to be a long night for the Hoosiers. Once the Heels established a perimeter game - connecting on 7 of 8 from three in the first half - it was open season inside for UNC's talented frontcourt, comprised of All American Brice Johnson, ACC Sixth Man of the Year Isaiah Hicks and veteran C Kennedy Meeks. The Tar Heels moved the ball so effortlessly on the offensive end, and without the ability of the Hoosiers to slack off the guards, it looked at times like a layup contest. The much anticipated matchup between the two Blue Blood schools, who had not met in the NCAA's since 1984, was expected to be a high scoring, up and down contest, between one program that relied upon its length and depth to push the pace and crash the boards - UNC - and another program that could hang with any team in the land because of its heady, veteran PG and its ability to stroke the three - Indiana. The Hoosiers knew that they had their hands full on the interior with the likes of Johnson, Meeks, Hicks and sophomore wing Justin Jackson, but Coach Tom Crean felt as if his Hoosiers could compensate for that disadvantage inside by doubling down, which would then force the Heels to shoot from the outside, a thing that they had struggled to do all season long. Well, that was until last night. The high powered Tar Heels offense put up 101 points on Indiana, the most points in a Sweet Sixteen game since 2012, which included a staggering 11-20 on 3FG's. For every Tar Heels fan out there, it was a thing of beauty. For every Hoosier fan, it was their worst nightmare. North Carolina at times this season has been frustrating to watch. Frustrating because of the amount of talent contained on the roster, only to watch them stumble to the likes of Northern Iowa and Texas, and blow a late lead in Chapel Hill to arch rival Duke. Many of their 6 losses this season were attributed to pathetic outside shooting and a lack of defensive tenacity. However, since the loss at home to the Blue Devils on March 18th, the Tar Heel defense has stepped up to championship level. An effort that saw the Heels destroy #11 ranked Miami by 25, avenge their loss to Duke at Cameron Indoor Stadium, and then pound Pitt (88-71) and Notre Dame (78-47) on their way to the ACC Tournament Championship game. There, they would then avenge another loss on the season, this time against the #4 ranked Virginia Cavaliers (61-57), a team who one day later would also earn a #1 Seed in the NCAA Tournament. Despite those efforts though, something was still missing. Yes, Brice Johnson had risen as the team's star and first-team All American. And sophomore PG Joel Berry has looked like a veteran floor leader since mid-season, leading the offensive scheme, knocking down jumpers, attacking driving lanes, and D'ing up opposing playmakers. And yes, junior F Isaiah Hicks has relished in his role as one of the best sixth men in the country. But it was not until last night, not until the 15:19 mark of the 1st Half, did the Heels finally start to click on all of their capable cylinders, and become the team that everyone was waiting to see all season long. A team that is so big and deep on the inside, that they are impossible to guard and keep off of the glass. A team with three veteran guards handling the ball on the perimeter, so that they are impossible to rattle. A team that is so long and athletic on the defensive end that they are impossible to break down consistently. And finally, a team that if challenged to win the game from the outside, will knock down every open look, making them impossible to defend. That is what we saw last night from the North Carolina Tar Heels, a team that if playing at that level, could be impossible to beat. Up next for the Heels in the Elite Eight, with a trip to the Final Four in Houston on the line, is conference foe Notre Dame (24-11). A team that beat the Heels in South Bend on February 6th, and a team that lost to the Heels by 31 in the semi-finals of the ACC Conference Tournament on March 11th. The Irish present some interesting match ups that UNC will have to be ready for, including the stellar play of PG Demetrius Jackson and the athletic interior presence of 6'10" Zach Auguste. That, coupled with the outside shooting abilities of VJ Beachem, Steven Vasturia and Matt Ryan, will certainly keep the Heels moving on defense. At this late stage in the game, it is never a good idea to overlook an opponent, especially one that already beat you this season. But if the Heels stay focused and continue their stellar defensive efforts and ball movement on offense, the Irish will be a distant memory come Sunday night. If they come out lax though, looking ahead to their next opponent in Houston, well then, Notre Dame definitely has the capabilities and talent to knock off the Heels and advance. After seeing what I saw last night though, my money is on the Heels. Vegas seems to agree as UNC has opened as a 9 point favorite.